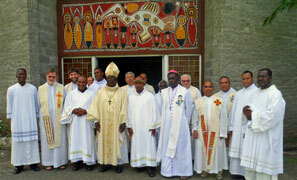 In a ceremony at Bomana, PNG, on May 26 Bishop John Doaninoel SM, ordained two Marist seminarians as deacons. The new deacons are Antoine Tamarak (Vanuatu) and Godfrey Pa'asi (Solomon Is). 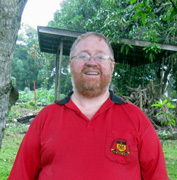 Australian Marist missionary, Fr John ('Hoppy') Hopkinson SM. sends greetings and his Pentecost newsletter from Bolivia. Celebrating 41 years of priesthood at this time, Fr John is a central figure in the development and support of Bolivia's numerous 'CEBs' (basic ecclesial communities). Click here for newsletter. 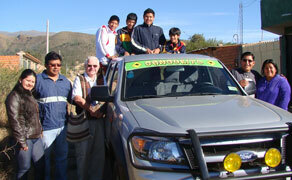 Pictured: Fr John Hopkinson (third from left) with the 'Misioneros Maristas' community and truck and / soccer team. With the announcement of a special year focussing on Marist Founder, Jean-Claude Colin, (see below) planning meetings at the Marist General House, Rome, have begun to prepare resources for use throughout the Marist world. 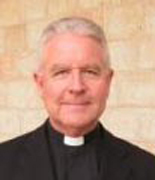 Fr Ron Nissen (Australian province) has had several briefing sessions with Postulator of Fr Founder's Cause, Fr Carlo-Maria Schianchi, and Vicar-General, Fr Larry Duffy. The Cause material will eventually find its way on to the Colin web site www.jeanclaudecolin.org. Expressions of interest can be made by visiting the site. Click here. This image of Fr Colin from a Tollet painting of an 1866 photograph is likely to be used in forthcoming publications. Simultaneous decisions in Rome and France have been announced which will have major influences on the Cause for Beatification of Marist Founder, Fr Jean-Claude Colin. 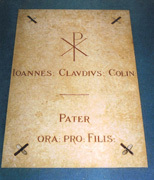 The General Council of the Society of Mary announced on May 17 a 'Colinian Year' to commence on Nov 15, 2012 (the anniversary of Fr Colin's death in 1875). 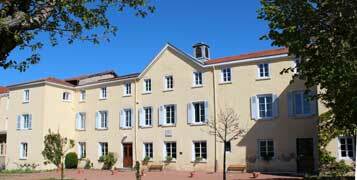 At the same time the European Marist Province has announced plans for renewed ministry initiatives and the refurbishment of 'La Neyliere', Central France, where Fr Colin spent the last years of his life and where he is buried. Another major decision is the endorsement of Fr Justin Taylor SM (pictured below) as official biographer of Fr Colin. Preliminary work and early chapters have already been completed. 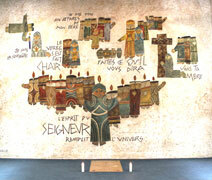 Below: The grave of Fr Colin, La Neyliere; contemporary mural-backdrop for Fr Colin's grave / recently-produced icon of Fr Colin, Marist General House, Rome. Associate Professor of Theology at Australian Catholic University's Banyo (Qld) campus, Fr Gerard Hall SM, has published two recent pieces on contemporary issues in interreligious dialogue. 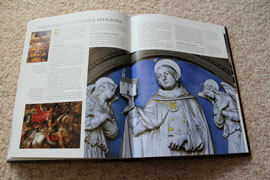 In 'Catholics and Catholicism in Contemporary Australia' Fr Gerard maps the thoughts, practices and discoveries of mediated, spiritualised change in Catholic Australia, whilst in 'Christianity' he has contributed a section on interreligious issues as part of this illustrated guide to 2,000 years of Christian faith. A graduate of the Catholic University of America, Fr Gerard edits the 'Australia eJournal of Theology' and is a members of the International Academy of Practical Theology and the Australian Catholic Theology Assocation. 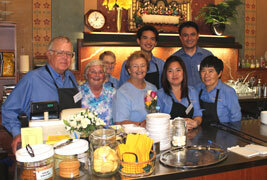 St Patrick's Courtyard coffee shop in Sydney's 'Rocks' continues its tradition of offering volunteers training in the finer arts of coffee-making. 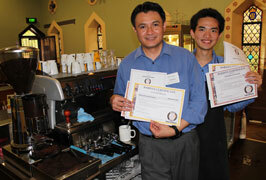 Latest staff members to graduate from specialised training are baristas Julius Relampagos and Jonathan Alvin (pictured). The enterprise is coordinated by Marist Missionary Sister Judy de Monfort SMSM some of whose volunteer staff have worked for over 10 years at the popular courtyard gathering place..
Eleven seminarians of Marist College, Bomana, PNG, are being guided in their annual retreat by Burnie (Tas) parish priest, Fr Tony Kennedy SM. Fr Tony reports from a 'hot and steamy Bomana': "I am using a multimedia approach with artistic images, photos and video clips. Main focus points are 'Being called - called as a Marist', 'Mary’s response -Marist responses', 'Instruments of Mercy', 'The Prodigal Son: being reconciled (and the ministry of St Patrick’s, Sydney)' and 'Eucharist as service, Eucharist as unity'." Using resources including Fr Craig Larkin's book,'Bearings', Fr Tony is giving examples from the lived experience of Marists following the Marist spirit, inviting his retreatants to reflect more deeply on their own Marist values and experiences. 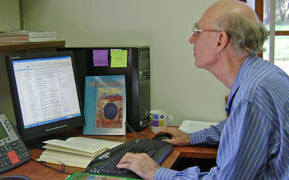 One session is on the new English translations in the liturgy recently introduced at Marist College. 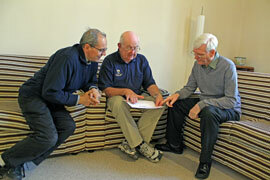 Once again members of the Marist Family are represented at the courses conducted at 'Marymount', Castle Hill, NSW. 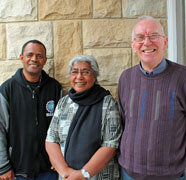 Pictured, left, are Br Josefo Logayau SM (Bomana, PNG), Sr Rosemary Simon SM (Fiji) and Fr Paddy Stanley SM (Ireland). The concurrent 6-month programs, 'Journeying with new members' (Br Sefo) and 'New Life Program' (Sr Rosemary & Fr Paddy) conclude in early August and have been popular with Marists for many years. As the Australian Catholic Media confraternity gathered recently in Sydney, the initiative of Marist missionary bishop, Jean-Baptiste Pompallier, was honoured. Members of the MAP (Marist Asia-Pacific) region are well represented in the founding community of the new Marist International Theologate at Via Livorno, Rome. Former director of Marist Mission Ranong (Thailand), Fr John Larsen, heads up the team, supported by Frs Pedro Alarcon (Mexico) and Donato Kivi (Oceania-Fiji). 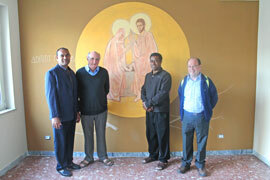 They are joined by post-graduate philosophy student, Fr 'Aisake Silatolu (Tonga). Marist seminarians from various provinces and mission districts will arrive in June to begin language studies and orientation. 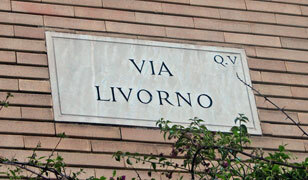 Below: Fr John Larsen at the entrance to the Via Livorno site. A 390-student school occupies the lower floors. The formation community will live on the third and fourth floors which are in the final stages of refurbishment. 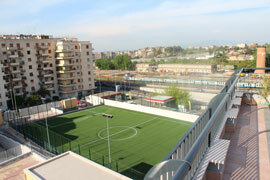 View from the spacious roof area. Br Tony Leon FMS will facilitate Marist Laity Australia's next reflection day to be held on May 05 in the crypt of St Patrick's, Church Hill, Sydney.